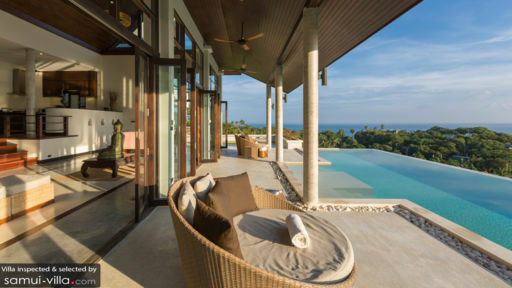 Villa Camille is a vacation residence that embodies the harmonious blend of traditional Thai architecture – with its conspicuous, high roofs – and contemporary tropical design. Interiors are appointed with finely finished and complementary woven wood furnishings accompanied by a few elaborate and elegant pieces, as well as adorned with large to life-sized traditional figures and modern depictions of classic Asian elements. Amenities are deliberately first rate – for each and every guest’s absolute convenience and diversion. Atop a hill high above Bang Kao Beach, Villa Camille accords you genteel living amidst a truly exotic and highland air. The villa has four bedrooms in two-storey wings on both sides of the common area – two bedrooms are in each wing. Three of these bedrooms have queen-sized beds, while one other bedroom has twin beds. Bedrooms on the second floor open out to furnished balconies with breathtaking views of the landscape, the beach and the nearby islands. While bedrooms on the ground floor have direct access to the scenic terrace and the infinity pool. All bedrooms have dedicated bathrooms with fitted bathtubs, as well as indoor and outdoor rain showers. At the edge of the property’s exterior is the 15-meter infinity pool. Dip into its alluring, crystal-clear waters that appears to ebb back to Bang Kao Bay. If you wish to bathe, instead, in the sun, laze on cushioned, woven wood pool beds – a couple of these partially covered by large umbrellas – on the poolside stone deck. But as soon as the rays begin to burn, retreat to the covered terrace and recline on cushioned, semi-circular, woven wood day beds. 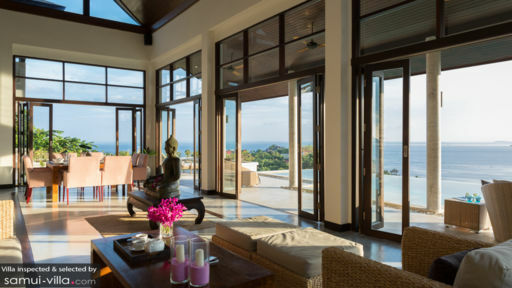 Accessed on three sides via wood-framed, folding glass doors is the villa’s spacious, high-ceilinged and airy common area. At one corner is the living area with its cushioned, woven wood appointments. Here, you can all assemble for some amusing and animated sharing and storytelling. Just across is the dining area. On its square, wooden table for eight, you can all feast on authentic Thai cuisine – as well as your most requested comfort food – concocted by the in-house chef at the fully-equipped, ultra-modern kitchen at an elevated corner alongside the dining area. Opposite the kitchen is the TV lounge where you can all catch shows you’ve been closely following. Or, watch, for the nth instance, your all-time favorite classic film. Assigned to the attend to the daily services of the villa is a staff composed mostly of housekeepers. Upon your request, a chef may be called in. However, his services will be charged separately. Boat and car rentals are also available. 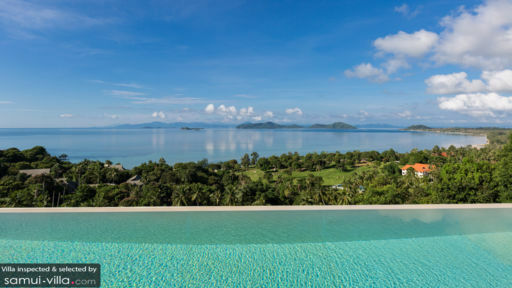 Villa Camille is based in Bang Kao Beach – a peaceful stretch of soft white sand on the southern coast of Koh Samui. Get onboard a traditional boat and go island hopping at neighboring Koh Matsum and Koh Taen where you can swim and enjoy different water sports. From Bang Kao Beach, you can also head inland to Wat Kunaram where you will find the remains of a monk – mummified in a meditative pose. A bit farther, you will arrive at the twin waterfalls of Namuang as well as Paradise Park. On other occasions, you can arrange tours to the Laem Sor and Khao Chedi Pagodas, the Samui Aquarium, the Tiger Zoo and the Butterfly Garden as well as to Grandfather and Grandmother Stones. You can also go elephant riding and trekking.